Not to be confused with Beaufort, South Carolina or Beaufort County, North Carolina. 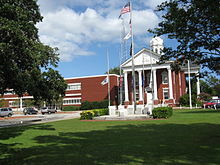 Beaufort (/ˈboʊfərt/ BOH-fərt) is a town in and the county seat of Carteret County, North Carolina, United States. Established in 1709 and incorporated in 1723, Beaufort is the third-oldest town in North Carolina (after Bath and Edenton). On February 1, 2012, Beaufort was ranked as "America's Coolest Small Town" by readers of Budget Travel Magazine. The Beaufort Historic District, Carteret County Home, Gibbs House, Jacob Henry House, and Old Burying Ground are listed on the National Register of Historic Places. In June 1718 Blackbeard the pirate ran his flagship, the Queen Anne's Revenge and his sloop Adventure, aground near present-day Beaufort Inlet, NC. The Queen Anne's Revenge was added to the National Register of Historic Places in 2004 with the reference number 04000148. Thirty two years later, in August 1750, at least three Spanish merchantmen ran aground in North Carolina during a hurricane. One of the three, the El Salvador, sank near Cape Lookout. Beaufort is located south of the center of Carteret County at 34°43′N 76°39′W﻿ / ﻿34.717°N 76.650°W﻿ / 34.717; -76.650 (34.7207, −76.6525). It is located on Beaufort Inlet, a channel leading south to the Atlantic Ocean. To the west is the tidal Newport River, separating the town from Morehead City. To the east is the unincorporated neighborhood of Lenoxville, extending to the North River, another tidal river. U.S. Route 70 passes through Beaufort, leading west across the Newport River to Morehead City and northeast 31 miles (50 km) to its end in the town of Atlantic. According to the United States Census Bureau, Beaufort has a total area of 5.6 square miles (14.5 km2), of which 4.6 square miles (12.0 km2) is land and 1.0 square mile (2.6 km2), or 17.75%, is water. As of the census of 2008,[needs update] there were 4,189 people, 1,780 households, and 1,048 families residing in the town. The population density was 1,374.4 people per square mile (531.4/km²). There were 2,187 housing units at an average density of 797.1 per square mile (308.2/km²). The racial makeup of the town was 75.87% White, 19.99% African American, 0.37% Asian, 0.11% Native American, 0.05% Pacific Islander, 2.39% from other races, and 1.22% from two or more races. Hispanic or Latino of any race were 3.77% of the population. There were 1,780 households out of which 21.9% had children under the age of 18 living with them, 40.3% were married couples living together, 15.3% had a female householder with no husband present, and 41.1% were non-families. 35.5% of all households were made up of individuals and 15.6% had someone living alone who was 65 years of age or older. The average household size was 2.07 and the average family size was 2.65. In the town, the population was spread out with 18.3% under the age of 18, 7.3% from 18 to 24, 27.9% from 25 to 44, 26.7% from 45 to 64, and 19.8% who were 65 years of age or older. The median age was 43 years. For every 100 females, there were 87.1 males. For every 100 females age 18 and over, there were 83.5 males. The median income for a household in the town was $28,763, and the median income for a family was $39,429. Males had a median income of $30,859 versus $22,955 for females. The per capita income for the town was $19,356. About 13.3% of families and 16.6% of the population were below the poverty line, including 35.0% of those under age 18 and 10.4% of those age 65 or over. Beaufort uses a council-manager form of government. The community elects a mayor and five council members. Mayors serve two-year terms, and council members serve staggered four-year terms. Beaufort is also home to the Carteret County main public library. On February 1, 2012, Beaufort was ranked as "America's Coolest Small Town" by readers of Budget Travel Magazine. Beaufort NC was named a 2015 Tree City USA by the Arbor Day Foundation in honor of its commitment to effective urban forest management. ^ a b Landphair, Ted (July 16, 2012). "Without Pierre". Ted Landphair's America. Voice of America. Retrieved July 23, 2012. There are two decent-sized port cities of the same name — Beaufort — on the U.S. Atlantic Coast. One, in North Carolina, is BOH-furt. The other, in South Carolina, is BYEW-furt. Yet they're both named after the same English duke. He was a BOH-furt. ^ "Find a County". National Association of Counties. Archived from the original on July 12, 2012. Retrieved 2011-06-07. ^ "Town of Beaufort". Archived from the original on August 4, 2009. Retrieved 2009-08-18. ^ "A Brief History of Beaufort, North Carolina". Beaufort Business Association. Archived from the original on August 1, 2008. Retrieved August 18, 2009. ^ a b "America's Coolest Small Towns". Budget Travel Magazine. February 2012. Archived from the original on February 2, 2012. Retrieved March 27, 2012. ^ a b "Geographic Identifiers: 2010 Demographic Profile Data (G001): Beaufort town, North Carolina". U.S. Census Bureau, American Factfinder. Retrieved December 22, 2014. ^ "Blackbeard's Queen Anne's Revenge". Nautilus Productions. ^ Heit, Judi (April 7, 2012). "North Carolina Shipwrecks: The Spanish Galleons ~ 18 August 1750". North Carolina Shipwrecks. Retrieved May 12, 2016. ^ "A Carteret County North Carolina Elementary Charter School". Tiller School. Retrieved May 23, 2012. ^ "East Carteret High School: Home Page". echs-ccs-nc.schoolloop.com. Retrieved April 3, 2018. ^ "Marine Lab Homepage - Nicholas School". nicholas.duke.edu. Retrieved April 3, 2018. ^ "Beaufort earns 'Tree City USA' designation". islandpacket. Retrieved October 19, 2017. ^ "Beaufort Sister Cities in Beaufort, North Carolina". Beaufort Sister Cities, Inc. Archived from the original on September 28, 2007. Wikimedia Commons has media related to Beaufort, North Carolina.